I wish I hadn’t waited over a year to really begin exploring the NOPA (North of the Panhandle) neighborhood in San Francisco. There you’ll find so many great restaurants, locally-owned grocery stores, shops and Alamo Square Park — you may recognize it from the opening credits of Full House (tourist tip: one of the painted ladies shown is not the Tanner’s house, theirs is on Broderick to the north) — and it’s all within about a non-hilly one mile walk from my apartment. My latest find: Nopalito. I had the pleasure of first dining there last month with Vijay, of NoshOnIt and buttermilk panna cotta with strawberry balsamic rhubarb compote fame, when he was in town. One of the dishes we ordered was the totopos con chile — tortilla chips coated with a house-made arbol-tomato salsa and sprinkled with Cotija, onions and cilantro with some sour cream and limes for a shot of tang — a fantastic layering of flavors and textures, and a unique chips and salsa presentation. The appetizer is such a tasty way to start a meal, I’m particularly fond of how the spice level sneaks up on you and how you can mellow it out with a dip in the cool crema. Is there a polite way to eat these in public? If so, I haven’t figured it out yet. You have a chili-tomato sauce that smothers the chips to contend with, plus the toppings (onions, cilantro) and a dip to manage. Fingers turn Doritos Nacho Cheesier! red. (But that and the whole tortilla-chip-based-snack thing is pretty much where the similarities end.) So you can (A) lick your fingers clean (Ms. Manners wouldn’t approve of that, right? ), (B) wipe it on their white cloth napkins (which I feel terrible doing knowing how difficult it is to get chili and tomato stains out of fabric) or (C) change your approach entirely, waiting to dig in until the chips have softened enough to eat with a fork and knife . . . that is if your dining companions are nice enough to save you any (not worth the risk). So even though this issue is certainly not going to keep me from ordering them as soon as I sit down on my next visit to Nopalito — and I’ll certainly be back! — it’s particularly nice to be able to enjoy the dish from the comfort of my own home. I think you’ll be pleasantly surprised by how easy the totopos are to make, and how addictive they are. What new dish or restaurant have you fallen for lately? Tell me in the comments! In a blender (preferably glass to avoid spicy, salsa-tasting smoothies), combine tomatoes through Kosher salt plus 2 teaspoons (9 – 10 grams) of the olive oil; set aside. In a 4-quart pot, heat the remaining olive oil (1 teaspoon or 4 – 5 grams) until shimmering. Add seeded chiles, and cook, stirring frequently just until toasted — about 30 seconds. Immediately scrape peppers and chile oil into the blender. Cover blender and process for about 1 minute, or until mixture is very smooth. Place a fine mesh sieve over the pepper toasting pot and press pureed mixture through with the assistance of a spatula to remove solids. DO AHEAD: Salsa may be made, cooled and stored in a tightly sealed jar in the fridge for up to 1 week. Warm slightly before using. FOR A FULL RECIPE: Preheat the oven to 350°F. Scatter the chips on two large, rimmed baking sheets and warm about 5 minutes in the oven — just until hot and the corn smell is noticeable, do not brown chips. Transfer about half of the chips to a large bowl along with half of the salsa. Toss with a spoon to roughly coat. Once chips and salsa are cool enough to handle, use your hands to more evenly distribute (gently rub, don’t just toss) salsa over the chips. Arrange chips over a large platter, sprinkle with half of the onions, Cotija and add a sprinkle of cilantro to taste (optional). Toss together remaining chips and salsa as before. Arrange chips over the first layer of goodies on the platter; top with remaining onions and Cotija and cilantro to taste. 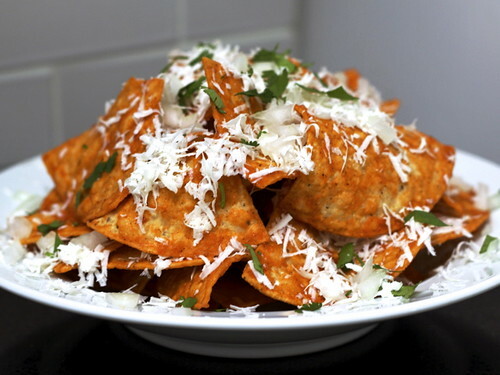 Serve immediately with sour cream, lime wedges and LOTS of napkins on the side (and small plates to be extra neat)! FOR A 1 – 2 PERSON SERVING: Preheat the oven to 350°F. Scatter 3 – 4 ounces chips on a small, rimmed baking sheet and warm about 5 minutes in the oven — just until hot and the corn smell is noticeable, do not brown chips. Transfer chips to a large bowl along with 1/4 of the salsa. Toss with a spoon to roughly coat. Once chips and salsa are cool enough to handle, use your hands to more evenly distribute (gently rub, don’t just toss) salsa over the chips. Arrange half of the chips in a bowl or on a plate. Top with 1/2 ounce (about 1 tablespoon) each Cotija and onions, sprinkle with cilantro to taste. Layer other half of chips over top; finish with another 1/2 ounce each of the onions and Cotija, and add a sprinkle of cilantro to taste (optional). Serve immediately with about 1/4 cup sour cream and a couple lime wedges plus a stack of napkins on the side! Polite, schmolite… I have a feeling my table manners would totally fly out the window! I also have a feeling that the full recipe serves just one hungry me.